With a friend, I visited Rhododendron State Park in Fitzwilliam, New Hampshire on Friday, July 12th. I had visited this park with my family back in 2006 and managed to catch the rhododendrons in glorious full bloom. Not so this visit. Most of the bushes had either bloomed and faded or hadn’t bloomed yet. It was before the heat wave so at least it was a pleasant hike through the woods on their well-maintained trails. If you live locally, it’s easy to stop in for a short hike with trails that are fairly level, shaded, and well marked. I took pictures that day with the idea that I would return the following week to see more in bloom. But alas the report last week from the Rhododendron State Park indicated that the heat wave had caused a sudden blooming that quickly died away, leaving a sorry sight. Unfortunately, I lost the photos of our trip in 2006; so maybe next year I’ll catch the blooms. It’s the luck of the draw where this park is concerned. 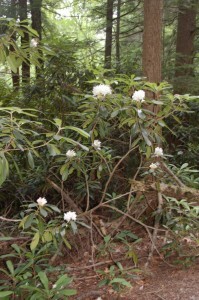 Visit the park’s website to see photos of the park in bloom and for trail info as well as to sign up for the Rhododendron State Park report. Maybe next year you’ll have better luck than I did this year! This entry was posted in Public Gardens, Uncategorized. Bookmark the permalink.